In the High School (also known as University High School or U-High,) high expectations go hand in hand with real, personal freedom. Lab attracts passionate students who excel academically and are excited by teachers and a curriculum that will help them expand their intellectual comfort zone. They are ready to take advantage of all our school has to offer; Learning to balance it all takes effort, but our students will tell you it’s exciting, and our graduates that it was worth it. The basic curriculum emphasizes analytical reading, writing, research, strong math and science skills, and broad access to the arts. Students regularly have free time, and the school works with students to help them learn to balance their workload and social needs. So, by the time students leave U-High, they are equipped with the independence and academic and personal skills they’ll use to navigate college and life with confidence and leadership. 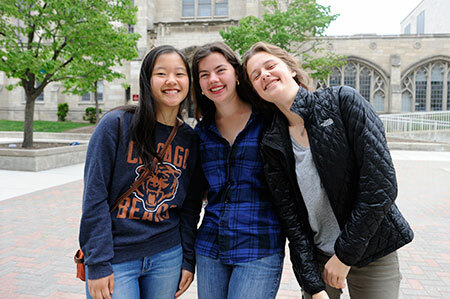 It almost goes without saying that virtually every U-Higher graduates from a four-year college, and they attend outstanding colleges around Chicago and the country. Students often devote significant time outside of regular school hours to many different extracurricular activities (sports, 40+ clubs, theater, journalism, academic teams, and more.) U-High’s 28 sports teams compete at high levels of competition. They achieve this within a “no cut” policy system that encourages students to play (nearly 65 percent of U-Highers play on at least one team) and distinguishes U-High from most athletic programs in the country. The students who make the most of all we offer are the ones who seem most excited by what the Laboratory Schools—and life—are all about.